PDF is popular file format but not support very well by Kindle device and Kindle App, If you want to read pdf files on your kindle, then you should convert pdf to azw, azw3, mobi format and so on. it is better experience to convert pdf to kindle format (.mobi .azw) format before you read pdf in Kindle device. Before converting pdf to azw kindle, you should make user pdf doesn’t have password protection. 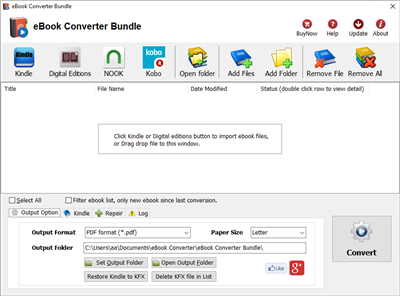 eBook Converter Bundle is tools to convert epub/azw/pdf ebook to epub/mobi/rtf/text format file, support eBooks purchased from Kindle, Nook, Google Play, Sony, Kobo and other online eBook stores. 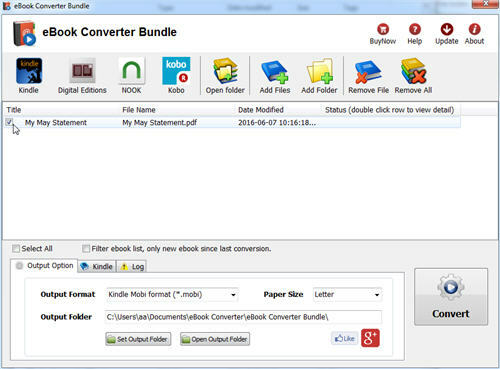 2) Drag pdf file into converter file list, or click Add Files button to add pdf file into list, mark checkbox. 3) Change output format to Kindle mobi format at “Output Options” tab at bottom. 4) Click Convert button to start conversion, it will takes minutes to finish job, new .mobi file save in output folder, click Open output folder to find new .mobi file.